Strong products, solid reputation The Slabinck family has had a special relation-ship with metal for over 200 years. The ancestors of the current business managers first worked as car builders and then as coach builders under the name “Carrosserie Slabinck Gebroeders”. The family business evolved and in 1989 the fifth generation took the helm. They decided to specialise in sheet metal processing and opted for the name Slabinck nv. 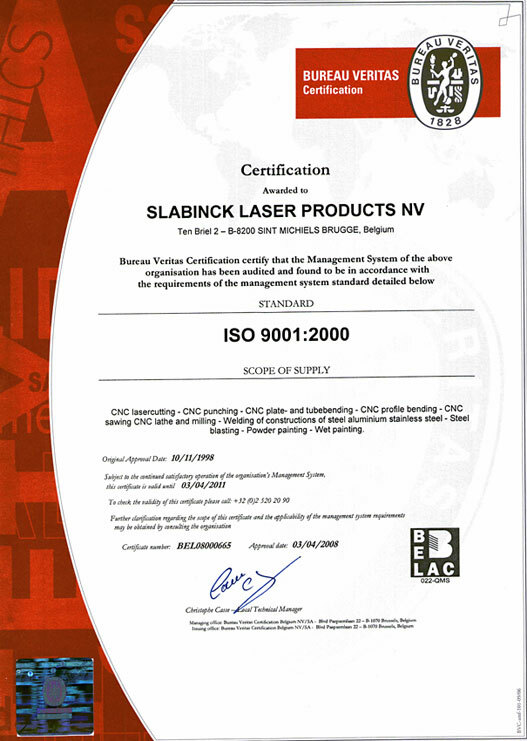 As Slabinck nv wants to supply high-quality products at acceptable prices the company pursues a consistent investment policy and strict quality standards and constantly improves its impressive professional knowledge. metal sheets in every imaginable form Slabinck nv has earned an excellent reputation in Flanders as a supplier in the metal sheet processing sector. The key of our success? 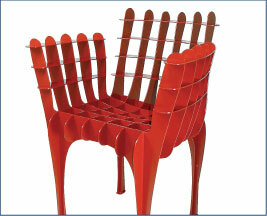 All Slabinck products are of impeccable quality and are finished to the very last detail. 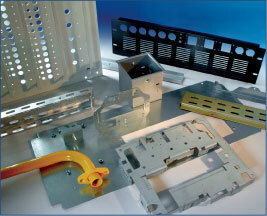 Machined metal nowadays is indispensable in numerous industries. 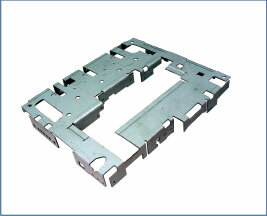 It is therefore logical that the machining process differs depending on the sector. Slabinck can do it all: from basic techniques such as laser cutting, punching, bending and welding over powder coating or wet coating to advanced finishing techniques such as inserting, turning, milling and spot welding. 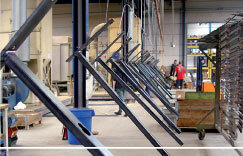 Everything is carried out on our premises according to the wishes of the customer. The result: short delivery periods, no unnecessary transportation costs and stringent quality control during the entire production process! In other words, Slabinck offers its customers a complete solution from metal sheet to finished product, both for single products and for mass-produced larger orders. - CNC laser cutting machine, Trumpf 3050 Capacity: 5000 watt - table 3000 x 1500 mm – maximum thickness in steel 25 mm, stainless steel 20 mm, aluminium 12 mm. - CNC laser cutting machine, Trumpf 3030 Capacity: 4000 watt - table 3000 x 1500 mm – maximum thickness in steel 20 mm, stainless steel 15 mm, aluminium 8 mm. - CNC laser cutting machine, Trumpf 3030 Capacity: 2200 watt - table 3000 x 1500 mm – maximum thickness in steel 15 mm, stainless steel 10 mm, aluminium 5 mm. - CNC laser cutting machine, Trumpf 2510 (fully automatic fast laser cutter for thin sheets) Capacity: 2000 watt - table 2500 x 1250 mm – maximum thickness in steel 12 mm, stainless steel 6 mm, aluminium 5 mm. - CNC combined laser/punching machine Trumpf TC600 Combined laser-stamping of metal sheets up to 6 mm, capacity 2000 Watt, table 3000 x 1600 mm, maximum stamp pressure: 22 ton - CNC punching machine, Trumpf TC 3000-1600 Maximum stamp pressure: 18 ton – 900 stamps / minute – for sheet lengths of up to 3000 mm and 4 mm thickness. - CNC Automatic punching machine, Trumpf TC 5000-6000 Maximum stamp pressure: 22 Ton – 900 stamps/minute – for sheet lengths up to 3m. - 2 CNC sheet bending machines, Trumpf, 50 ton For bending of lengths up to 1250 mm. - 2 CNC sheet bending machines, Trumpf, 85 ton 85 ton – for bending of lengths up to 2500 mm. - CNC sheet bending machine, V8 Trumpf, 85 ton Six-axle back gauge – bending of lengths up to 2000 mm. - CNC sheet bending machine, Trumpf, 130 ton Six-axle back gauge – bending of lengths up to 3100 mm. - CNC sheet bending machine, Trumpf, 170 ton Bending of lengths up to 4 metres, with a maximum pressure of 170 ton - 2 CNC sheet bending machines, Fin-Power, 40 ton Six-axle back gauge – bending of lengths up to 1600 mm. - CNC LVD sheet cutting machine Cutting of lengths of up to 3000 mm and 13 mm thickness. - CNC Profielwals Thoman Type RB 3L Bending of profiles and pipes until 6m lengths - CNC Tractobend pipe bending machine With CAD-CAM-programming – for bending of pipe between 6 and 50 mm diameter. - LVD sheet bending machine 30 ton, for bending of lengths up to 2500 mm. - Fully automatic sawing machine FMB Jupiter Maximum diameter of 250 mm. - CNC lathe Haas SL – 30TGHE 30 kW, for diameters of 600 mm x 2000 mm, machine fitted with c-axle for power-driven equipment. - Tos lathe For diameter 450 mm x 1000 mm with digital readout. - CNC milling machine VICTOR Vcenter - 205 Table dimensions 2050 x 650 mm, with pendulum option and fourth axle. - Chevalier tower milling machine Table dimensions 1200 x 254 mm with digital readout. - Punching machine IMS HV, 60 ton Stamp for holing and cutting of profile. - Raskin press machine 80 ton pressure force. - Van Groenweghe grinding and polishing machine (2 bands and 2 brushes) For pieces of up to 650 mm width. - Fim notching machines machine Notching of sheets up to 300 mm and 6 mm thick. - Welding robot ‘Valk Welding’, type VROO6ALE-2 Mounted on an H-frame with 2 freely programmable manipulators, fitted with two tensioning frames of 3100 x 1000 mm. - MIG and TIG welding via offline programming Inverter-driven, pulse source welding, 350 ampere. - Welding robot ‘Valk Welding’ TA – 1400 WG Installation fitted with automatic tables in a pendulum system. Dimensions 2000 x 750 mm, inverter-driven, pulse source welding, 350 ampere. - 16 x Esab half-automatic welding units For welding of steel and aluminium - 3 x 400 ampere, 12 x 320 ampere, 2 x 250 ampere. - 8 x TIG welding units Esab For welding of inox and aluminium - 4 x 250 ampere, 4 x 160 ampere. - 2 stationary spot welding machines CEA Spot welding of steel up to 6 mm thick. - Stationary spot welding machine ARO 125 kVA Spot welding to a depth of 700 mm and 8 mm thickness in steel. - Stationary spot welding machine ARO 30 kVA Spot welding of steel up to 6 mm thick, with 550 mm welding arm. - ARO “hanging” spot welding machine 15 kVA Arm up to 450 mm in length, spot welding to 4 mm thickness. - Pillar drilling machine Ibarmia CM4 Drilling to a diameter of 32 mm without pre-drilling. 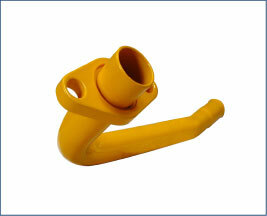 - Pillar drilling machine Strands Drilling to a diameter of 40 mm without pre-drilling. - 3 thread tapping machines Quick-Boy Automatic tapping to M16. - Fully automatic stud welding unit Soyer Stud welding to M8. - 2 rolling machines Luna Electric rolling up to 2 m in length and 6 mm in diameter. - Roto-finish smoothing and polishing machine ST11TM Net volume: 150 l. - Automatic shotblasting installation Rösler ( chainsystem ) Automatic blasting of parts 1600 mm hight up to 1000 mm width. - Semi-automatic pearl shotblasting calin 8 x 5 m Pearlblasting of stainles steelparts - 1 industrial spray cabin, heated, type Garmat 14 x 5.2 m - (for dust free spraying of large constructions). - Grinding and polishing machine Van Groenweghe Grinding and polishing of pieces up to 650 mm wide. - Own transport Mercedes Actros Lorry 18 Ton Loading volume L 8,20m B 2,45m H 2,50m, loading platform, lifting capacity 2 Ton.